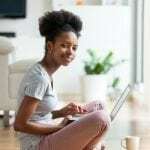 Even if you take a break from formal homeschooling during the holidays, it’s still easy to help your kids keep learning! How about this fun science project/experiment? This Christmas science experiment takes a little while, but it’s worth it to wow your kids with how Borax makes snow crystals out of pipe cleaner ornaments. It’s a little like how the Word of God makes us more sparkly—if we stick with it! 1. Shape various Christmas ornaments using pipe cleaners. For example, shape pipe cleaners into a stocking, star, or cross. Note: The shapes must fit into the jars. 2. Tie a string to the top of the ornament. 3. Fill jars with hot water. 4. Add three tablespoons of Borax to each jar of water. 5. Lower the string so that the ornament is completely covered. Then tie the string around the top of the open jar to keep it in place. 6. Leave the ornaments in the water overnight. 7. 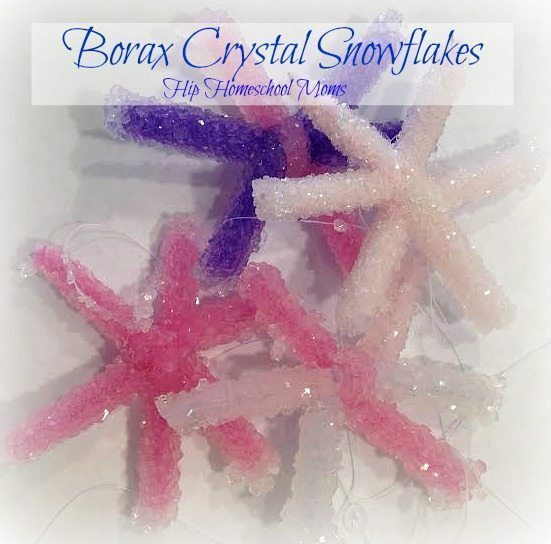 The next day, the Borax will have crystallized in the water and become attached to the pipe cleaner ornaments. Borax is an example of a crystal. Salt, sugar, and Epsom salts are other examples. Hot water molecules move away from each other. When you add Borax, the molecules make room for borax crystals to dissolve. But a point of saturation can be reached, meaning there will be some remaining crystals. As this water cools, the water molecules move closer together again. Crystals begin to form and build around another item in the water, such as the pipe cleaner. This is especially true as the water evaporates. The Borax crystals are a little like God’s word. We can read the Bible and it doesn’t seem to make much difference in our lives—not right away. But the word of God sinks in slowly. We have to have patience. Our walk with the Lord is life-long. Philippians 1:6 says you should be “confident of this, that he who began a good work in you will carry it on to completion until the day of Christ Jesus.” Someday we can be assured of being complete–like beautiful snowflakes–if we read God’s Word regularly. Even though we might look like plain ole pipe cleaners while we’re reading at first! This is great, I finished a bunch of science projects, I will be adding this to our snow theme in January. I’d like to do this, but is there any way to seal the crystals to the pipe cleaner so that they can last? Hairspray, maybe? Do you know? (I’m not a crafter!) I’m assuming the crystals will easily fall off. Beautiful object lesson to go with it. I can’t wait to try this but I am wondering about doing it with our Sunday School children but we wouldn’t be there the next day. I do this every year with my kindergartners and we have left them in the solution over the weekend and they do just fine. It is a really cool project and the kids are always amazed. You just have to make sure that the water is either boiling or very close to boiling or the crystals will not form. Good luck! I tried this with my class yesterday and looked this morning and nothing happened!! They are going to be so disappointed. What did I do wrong? Oh no! I’ve tried it several times, and it has worked very well every time. I’m very sorry it didn’t work correctly for you! (One of the times I tried it was when I made the ornaments that are shown in the photo at the top of the post.) Did you make sure the Borax was completely dissolved? And did you use pipe cleaners? It works much better with pipe cleaners or some kind of yarn or string that has a lot of texture. Also, you might want to try adding more Borax than the recipe calls for. I don’t see how it could hurt to use more than the recipe calls for. When I did mine, it only took a few hours for the crystals to start forming, so you might want to try it again at home tonight and then do it again with your class first thing in the morning–or even this afternoon if you have time. I hope it works better for you next time! Ours did not work either. Is the water suppose to be tap water hot or hotter? Mine was super hot tap water. But it’s hard to say what might have gone wrong. I made these several times and didn’t have any trouble. I would suggest trying it again and using more borax to see if that does the trick. I want to try these but don’t have the borax. I wondered if you’ve tried them with Epsom salt or salt or sugar? Has anyone tried to make colors? Maybe drop some food coloring in one to try? yes that would work with any kind of crystal. you can add food coloring and even flavoring if you want – but sugar is the only one you would want to eat..
MAYBE. Use a clear acrylic spray paint in light coat? I would try this outside not just for ventilation but also not sure what type of reaction it might cause. I an an artist but not a chemist! Lol! My Granddaughter has been into growing crystals lately so we are definitely going to try this out! Thanks! What a great little project, they are so pretty. I love this idea! I especially like the discussion part. You could go on to add that when we allow God’s word to work in our lives, we can then shine for him, like the crystal snowflakes shining from the tree. Definitely doing this one. My girls will love it! This is a fabulous idea and I love the analogy. Going to do it with my kids tonight! Okay, not sure what I did wrong, but it didn’t work for me. Any suggestions? I used a qrt. sized mason jar. Was that too much water for the 3 tbsp. of Borax? I used really hot tap water and stirred in the borax. I tied the pipe cleaners on to the string so that it was suspended in the jar. Please let me know how to fix it because it’s a totally cool idea. It is 3 tablespoons Borax to 1 cup of water. Plus, I have read on other sites that they get frostier every year. I will probably just wrap them in tissue paper and store in a little box. Thank you. I will try this again! The water needs to be boiling or very close to boiling for the crystals to form. I’ve always wanted to make these. Yours turned out beautifully. Didn’t work? Could my house be to cold? Thank you for sharing these instructions. I am making them with my elderly patients. They will love to have these hanging in their Windows. I will also make then with my granddaughter and use your teaching. Thanks again! Borax is somewhat toxic if injested, and is listed as toxic on the box. Very young children are tempted to put this sort of item in their mouths, as it looks like candy. Just use common sense and instruct age appropriate children. Yes, all science experiments should be supervised (whether they contain toxic substances or not) when young children are present. Thanks for the reminder! Can anyone tell me if I can do this with plastic containers? Do they have to be glass? Christy, I honestly don’t know if the containers have to be glass or not. I’ve always used glass. I apologize for not being able to answer your question! I would suggest just giving it a try and seeing what happens. 🙂 Then maybe you can come back and let us know how it went! Can you put more than one ornament in a jar? If you do, it’s possible that they will “grow” together. It would have to be a pretty big jar with plenty of room between them. But honestly, I wouldn’t recommend it. I would rather not take a chance on having to break them apart and ruining them. Maybe you didn’t give it enough time. Or it could have been that your solution didn’t have enough borax in it. The crystals don’t actually freeze–they form slowly over time. Depending on the concentration, the crystals could take hours or perhaps longer to form. I just stumbled to your blog looking up winter activities for my 2-year-old. Love your ideas and more importantly love your name. Mine is also Mary Kate.